You just bought a really awesome smart home Nest camera that can recognize faces, has a 4k resolution video that can make you zoom into the video like on those crime scene tv shows and allow you to comb through 30 days worth of stored footage. But here’s the catch, you have to pay hundreds of dollars for the features we’ve listed for every Nest Camera you own. If you don’t, then that smart camera you just bought will just become a glorified webcam. Will your money be worth it? Get the Nest Cam Indoor on Amazon (CA/UK/DE) or on eBay! Get the Nest Cam IQ on Amazon (CA/UK/DE) or on eBay! A Nest Cam with an Nest Aware subscription gives you the most peace of mind for the area that you’re monitoring. This peace of mind, however, will cost you more than you think. 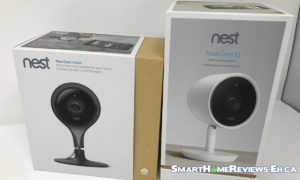 For a two year subscription, for two Nest cameras, the total cost is going to be over $1500 USD! Without Nest Aware, you basically retain all the hardware features of the camera such as watching live video, 2-way communication and the occasional notification that something is going on in that room. We didn’t get to this conclusion just by looking at the specs and subscription rates of the Nest products. We actually spent several weeks using them in our homes before we come up with this review. During our testing phase, we let the subscriptions lapse and discovered that our Nest cameras were pretty useless without Nest Aware. We actually went as far to RE-SUBSCRIBED to Nest Aware to see what else we might have missed. For this Nest Aware review, we focused our attention on the peace of mind these cameras brought to our home. With the Nest Aware, your 24/7 video recording will be stored on the cloud. You have 10 days for the $10 per month Basic subscription while you have 30 days backup recording for $ 30 per month Extended subscription. Without Nest Aware, you get 5 hours of activity. Not videos, just tiny clips that show you something has happened. If you’re never home, the 10 or 30 day cloud storage feature is going to be handy just in case someone broken into your house But, let this sink in. You’ve just spent $200-$300 dollars on a Nest Cam but without Nest Aware, it has done almost nothing to help you in the off chance something bad happens. This is a handy feature that allows you to share whatever good or bad thing that’s going on in your home. There’s honestly an appeal of getting a notification of one of your family members falling while putting on their shoes.That’s a funny video you can share. Or if you’re a parent, you can set your Nest cam right in the middle of your kitchen and watch your child eat the icing off a cake. But if you bought your Nest cam for a peace of mind, this might not be a useful feature. Aside from being able to share the video of your home being broken into with the authorities, we really don’t see that the use of this feature on your day-to-day life. We’d recommend using it for anything else other than monitoring your cake and your child. Without Nest Aware, a Nest Cam Indoor is going to trigger on anything that moves in the FOV. If you live on a full household, this might get annoying if you don’t set your notifications right. The notification of a Nest Camera is better with a Nest Aware than without one. Nest Aware reduces the amount of notification you will get.The Nest Aware seems to be able to filter out “un-interesting” events (that’s the best way we can put it). We placed a camera with “dumb” notifications beside a Nest Cam Indoor and the frequency of notifications during our Nest Aware subscription period noticeably less than the “dumb” camera. When it comes to providing peace of mind for you home, these improved alerts/notifications should only alert you when something worthwhile is happening. Which is important since you don’t want to be inundated by alerts of leaves rustling outside. In our Nest Cam Indoor and Nest Cam IQ review, we have pointed that the facial recognition is a big selling point for us. It is a very neat feature. But in the grand scheme of things, is it really important for your camera to recognize faces in general? If something bad was to happen, there’s still a good chance you’re going to be able to capture that person’s face. It can be useful in certain cases like when a family member brings a new friend inro the house. But that seems like such a fringe benefit. When it comes to monitoring your home, do you really need to see everybody’s face? How much will it cost to run for Two Years and One Month? First of all, you need to buy the cameras itself. For a Nest Cam IQ and Indoor, you’re going to spend $500 USD’s. With each camera, you get 30 days free of the 10-Day Nest Aware subscription. This why this scenario is two years and one month, to make the math a bit easier. Unlike Google Drive that let you use your subscribed Drive account no matter what device you’re logging into, Nest Aware subscription should be done for every Nest product you own. Yes, if you have two Nest Cameras you need to subscribe twice on Nest Aware. Although Nest says that the second camera you will subscribe into will have 50% discount. Upon further inspection we found that it’s $ 50 dollars OFF instead of 50 % discount. For the 10-Day Basic subscription, it is going to cost $100 dollars a year for one Nest Camera and only $50 for the next. For the 30-Day Extended subscription, it is going to cost $300 dollars a year for one camera and $250 for the second camera. Again, $50 dollars off, not 50% off. Over two years, in total, this is going to cost you $800 USD for the 10-Day plan and $1600 for the 30-Day plan. Is your peace of mind worth that much money over two years? Now let’s look at it from a monthly basis. $2.19 equates to $66/month. Which is getting close to the monthly costs for the cheapest ADT and Vivint security systems. Again, this is a decision you have to make. We personally think of many ways to spend that much money on something else. We suggest the D-Link Omna. It’s $200 dollars + change for an SD card. The D-Link Omna has built in activity zones into the app that doesn’t require a subscription. You can access the units SD card remotely though it’s not in full HD. There are no intelligent alerts so you’ll be notified of any movement in the activity zone and it has no facial recognition. If all you’re doing is trying to figure out what’s going on in your home, the D-Link Omna should suffice. The only time that Nest has a definite upper hand is in the occurrence that the camera itself get’s disconnected. So either a miscreant is smart enough to power it off or your house gets destroyed. Having the footage stored online might be handy in both instances. Can you subscribe to Nest Aware when you need it? One of the things we wanted to know was what happens if you re-subscribe to Nest Aware after letting it lapse, We thought of this in a scenario where you had a Nest cam running (without Nest Aware) and something happened. Could you subscribe and see the previously recorded footage? The answer is no. On our setup, all the previous alerts for the Nest camera was blacked out with the message “Camera was off or offline”. With everything that we’ve written, could you justify the $1600 dollar cost of running two Nest Cam’s over two years? We think that most of us probably have better ways of spending that amount of money. We’re not saying that your peace of mind for your homes isn’t worth $1600 dollars but we know there are cheaper alternatives that will achieve the same result. We hope our Nest Aware review has helped you out. If you liked this post and are considering getting some for yourself, check out our links to purchase your products. Let us know if you have any comments or questions in the comments below!